There are three kinds of Republicans in the Senate today. First, there are those willing to follow the lead of Senator Mitch McConnell – whose approach to financial sector reform apparently amounts to little more than, “Don’t worry, be happy”. If Senator McConnell has a reform plan he would like to lay out for review, now would be a good time to put some credible details on the table. Based on what we have seen so far, Senator McConnell proposes to do nothing regarding the systemic risks posed by today’s megabanks and just “let ‘em fail” when necessary. This is a dangerous and irresponsible position, and it should be opposed tooth-and-nail by anyone who actually cares whether or not we run ourselves into a Second Great Depression. The second group has remained silent so far, waiting to see which way popular opinion and their leadership will go. Most likely, almost all will cast their lot in with Senator McConnell. And if Senator McConnell brings 40 Senators with him, they will defeat the Dodd bill – and then smash themselves into the rocks of November 2010 as the “too big to fail” party. Perhaps we should welcome that. These Senators (so far I have a list with precisely three names; tell me if you have more) begin to understand that allowing our megabanks to continue in their current form makes no sense. The power of this idea is starting to get through (also at BusinessWeek). Saying we should do nothing about these megabanks makes no sense. And trying to turn the argument on its head to claim that, “a greater number of smaller banks would pose an even bigger risk of taxpayer bailouts” is truly not a powerful idea. So what are the prospects for Senator Dodd’s financial reform bill, which is expected on the floor soon? Could it even be strengthened, for example in the direction that key Democratic Senators are already pushing? The American people are legitimately and completely outraged by how big banks continue to behave. In such circumstances, you may think you have a backroom deal, but when it surfaces and people begin to do the math, the backlash can move things in an unpredictable direction. Senate Democrats are only now beginning to understand what the bill-as-drafted would and would not do. Almost all Senate Republicans are likely against the bill, but that “almost” may matter. In short, anything can happen. So it’s a good time to call your elected representative. 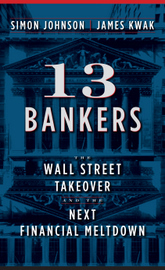 Or just email them this link: http://13Bankers.com (this is why we wrote the book). This entry was posted in Commentary and tagged Republican Senators. Bookmark the permalink. The Dems have the opportunity of a lifetime to throw down the gauntlet here. Go whole hog on the Senate bill. Re-instate Glass-Steagall with the money market funds and repo market and rest of the shadow banking system declared to be a bank and regulated as such. Proclaim Citi, BofA, JPM, WFC, GS, and MS as officially too big to fail and thus to be broken up immediately. Tell the Republicans in no uncertain terms – you want the end of TBTF, well, here it is. DARE them to vote against it. Endgame. It will be interesting to see how Blanche Lincoln’s derivatives language – what I see as her attempt to not be outflanked by Bill Halter in a primary challenge – impacts the politicking. Now is the time. I am becoming more optimistic by the day about passing really meaningful legislation. If Dodd bill can make through the Senate, it will probably be strengthened in conference by adding stronger features from the Frank proposal. Hopefully, Blanche Lincoln will get her way and have banks banned from the derivatives market. This would be a meaningful reinstatement of a small portion of what Glass-Steagall would mean if reinstated entirely — unlikely. But Blanche’s amendment would be a real key in changing business on Wall Street. I’d love for you to win this battle, Simon. I’ve been doing my share, both writing and calling those I know. I suspect, however, that real change will wait until more wealth in the right places gets vaporized (which could happen at any time). It’s a big hill to climb, but I’m game. Let the unfolding facts validate the argument. In 10 years, we’ll probably be worried about regulatory over-shoot. The incumbents in Congress will already have heavy indications of what they face electorially. Will there be an anti incumbency reaction in the primaries? This is probably the most important question they face in their careers. They must be correct. We will soon know. May is the first important primary month with ten states holding primaries followed by 14 in June. If incumbents face a backlash over TBTF and bankster piggishness they must do something before the May elections no matter when their own primary is. The first May primary date May 4th followed by May 11th. The incumbents get tossed in May and a pattern is set that the rest of the incumbents must overcome in later months. Astute politicians understand the benefits of action before the May primaries. That is, if these politicians in Congress are convinced that inaction on putting Wall Street in it’s place hasecome a survival issue for them personally, they will act. The polls indicate a severe backlash against incumbents is out there. The severity is more open to question. But, a 5 % swing of voters against the incumbent specifically will cause most to lose their seat personally. I keep hearing that well over 50 % of voters of both parties think their incumbent should be turned out of office. The polls are all over the place. These polls are heavily influenced by the blow hard voter that does not show up at primaries. On the other hand, the determined anti incumbent voter will turn up to vote against the incumbent. But what do the incumbent’s know as insiders? Bayard’s remarks are “spot on” as the Brits say. are more effective–so let’s bring them back! The market has not proved effective or efficient in regulating itself. Go watch the C-SPAN archives and find the video of Corker and Dodd press conferences held around March 10 or 11. I’m positive Dodd’s bill, or one with minor modifications taking it more to the right will pass. I believe they mentioned there were 11 broad items in the bill; and 2 of them didn’t garner a bi-partisan agreement. It sounded like Dodd asked majority and ranking members to pair up on compromises. The 2 still waiting to be hammered are TBTF and CFPA, and Gregg-Reid never got fully done with derivatives. GOP position is that there should be loopholes for derivatives trading, I think everyone should listen to Brooskely Borne, *no loopholes*. I regret having young family that stopped me from going to Culver City this week and meeting Dr. Johnson, I’ve admired his work and the fervor and passion he shows in front of Congress. I desperately would like a 13 Bankers signed “Goldman Sachs would not be here without TARP, eff Gerry Corrigan…” someone needs to ask for that personalization, stat! Can Simon, or anyone, please reiterate the current standing points of the Dodd bill. Does it address too big to fail, and even more importantly (or just as importantly), leverage, on any meaningful level? Or proprietary trading with depositor monies (or anything related to Glass-steagall)? Because, as far as I’m concerned, if proprietary trading isn’t outlawed by lending institutions and leverage for all institutions isn’t brought down to low single digits, we’ll always have systemic risk. Let me begin my saying that I detest Mitch McConnell and Republicans in general. But McConnell raises a point we should pursue. Why not let the next TBTF, fail? Provided that there is a plan in place to proceed with the creation of a new financial and credit system (which I’m sure McConnell and Republicans would be opposed to, not to mention Wall Street and the pit people in Chicago), can we not use the next TBTF failure to bring to an end the speculative reign of usurious terror of the past three decades? As I discussed back in April 2008, in Euthanize Wall Street to save the economy, and again in September 2008, in Let Wall Street Burn, the evidence is that the financial innovation of derivatives have done little or nothing to assist the real economy, and in fact have become an unbearable burden that is actively destroying the industrial base, and the working class and middle class. In other words, the credit mechanism of society no longer serves the purpose it is supposed to serve. That’s why we have been unable to lessen our dependence on imported fossil fuels (let alone the question of fossil fuels themselves) which has supposedly been a goal of both Democrats and Republicans since the first oil embargo in the 1970s. If the credit mechanism of our society is so useless to the achievement of society’s goals, then perhaps we should welcome the next implosion of one of the TBTF institutions of that credit mechanism, and plan to use the event for beginning a radical switch to a newly designed credit system that will actually direct credit to those problems our society needs to solve. Instead of credit flowing to speculative bets on which way the dollar will go in regards to the yen or the Euro, or which way interest rates go, let’s design a system in which credit flows to the entrepreneurs and industrialists actually trying to build the future productive capability we need. So that someone sitting high above the canyons of lower Manhattan is weighing whether to invest in building a wind turbine transformer plant in Detroit or a new urgan mass transit rail system in Phoenix, instead of looking at credit default swaps on Morgan Stanley’s bonds. The supreme irony of McConnell’s position is that it’s in accordance with my position. And I’m a socialist! If we allow the banks to fail (which they will anyhow), the ONLY alternative will be some form of centrally planned economy — and if Mitch doesn’t like big government, let alone socialism, then he ain’t seen nothin’ yet. The monumental failure of our financial system would lead to exactly the sort of social levelling that is the Repulican party’s biggest nightmare. Go for it, Mitch, I’m with YOU! Well, you would think this would be an easy one for the Dems to beat the Republicans on, but I’m sure they’ll screw it up like they usually do. Simon, in a future post could you provide some sample language for readers to incorporate into letters to their representatives? I could cobble together something of my own, but something you wrote would probably be more accurate and hard-hitting. I’d then send the language along to friends and family, urging them to customize it and mail it to their representatives. The words “sensible” and “Republican” do not long stay conjoined. Beyond the assumptions of how society’s goals may unfold if unfettered and unleashed, there are perverse elements within the oligarchial power structure that might outwardly oppose TBTF, but are ready and waiting for chaos to ensue because of the opportunity for mischief while everyone’s looking the other way. Well we could let them practice with the USPS. It isn’t a financial institution but its tendrils run all through American society (and technically the world – everybody has a cooperating postal system). Let this dinosaur fall over and see where the chips fall. The best reason to avoid Mr. McConnell’s idea of just let them fail is, it’s not necessary. If financial reform were instituted to break up those banks so they’re not too big to fail, we don’t have the problems. And not only that, if the banks are too small to be playing with things that might blow up in their faces (like derivatives, etc. ), they’ll be doing what helps make America truly great… lending! Actually, it’s not “sensible” and “Republican” that make no sense, it’s “politician” and “sensible”. If you really look closely, you’ll see there’s not really very much difference. They’re both hooked on the power. Neither really gives a damn about the people who vote for them. Great posting Vic! It would be painful but it would finally bring this all into the real world. OK – what these big banks are doing is bad, but isnt what Congress does with Social Security Funds (for years now) far more egregious? Where did Congress learn their accounting practices from? Why doesnt Simon and James take on this fraudulent scam? WHERE IS MY LOAN MODIFICATION BANK OF AMERICA?